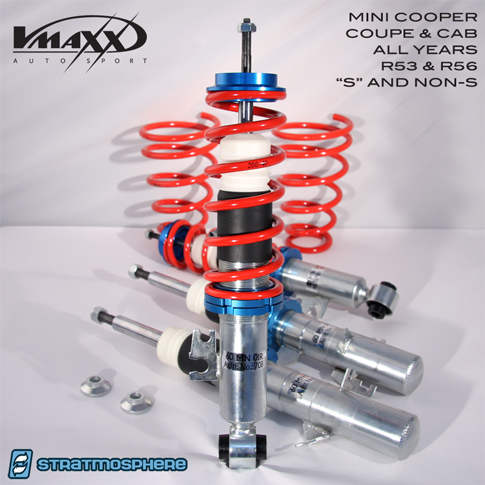 With the new V-Maxx coilover kit for the Mini you can expect improved handling, lower center of gravity and daily driver ride quality. The V-Maxx kit is a fully adjustable kit that allows you to control the amount of lowering at each of the four corners of the car. Drop Range Front 40-70mm, Rear 30-65mm, Convertible rear drop min of 35mm. Fully adjustable ride height that you need. Full 2-year manufacturers warranty back by V-Maxx solid support. TUV tested and approved products. Kits that are balanced between sports car requirements and daily driver needs. Custom struts matched to springs and ready for full height ranges.